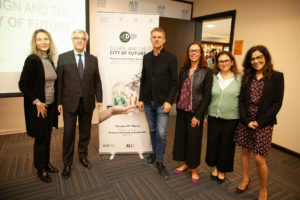 Dubai, UAE, 20 March 2019: The Italian tradition is a mix between beauty and function, said His Excellency Liborio Stellino, Ambassador of Italy to the UAE, following a special preview of the Italian Pavilion for EXPO 2020, presented by Carlo Ratti, Professor, Massachusetts Institute of Technology; Founding Partner, Carlo Ratti Associati, and one of the architects that designed the Pavilion during Italian Design Day on March 19, at the American University in Dubai. Stellino stressed that legacy is an important element driving Italy’s participation in EXPO 2020 and that the Pavilion aims to showcase key learnings related to food safety and security and future energy gained from previous Expos in a bid to address the global challenge facing sustainability in a more holistic manner. Stellino said that despite being associated with classic and traditional buildings, Italy has made great strides in integration of technology for modern infrastructure, owing to the expertise of the engineering and architectural community, stressing that innovation is in their DNA. “The close link between entrepreneurship and art has oriented our design in a more functional way,” Stellino said. Ratti discussed the vital role sustainable cooling plays in modern infrastructure, adding that while the Italian pavilion will be generally cooled using air conditioning, there is a move to incorporate passive cooling design elements to make the most of the time of the year, when the UAE has cooler temperatures.